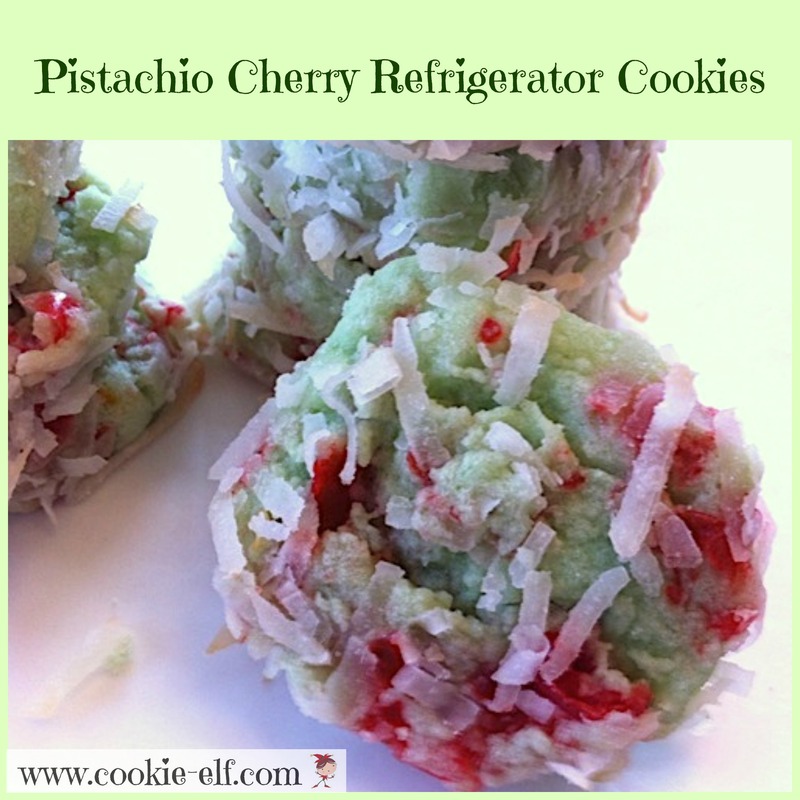 Red and green meet in Pistachio Cherry Refrigerator Cookies in these festive slice-and-bake cookies -- one type of refrigerator cookies made from dough, shaped into cylinders, chilled, and then cut into cookies for baking. They're such a timesaver! You can keep the rolled dough in the fridge for several days until you're ready to slice and bake the cookies. It's the pudding in the mix that gives these cookies the green tint and their moist chewiness. Drain maraschino cherries. Chop them finely, either with a knife or in a food processor with a steel blade. Drain and blot chopped cherries on paper towels to remove excess moisture. In a medium bowl, cream together butter and sugar together until light and fluffy. Beat in pudding mix and almond flavoring until the mixture is smooth. Gradually blend in flour to creamed mixture, adding a bit at a time and mixing until smooth. If you would like dough to be a deeper color of green, add a few green food coloring. Gently fold in chopped cherries. Cover bowl securely with plastic wrap. Chill in refrigerator for an hour. Remove dough from refrigerator. Roll dough into 2 logs, about 12 inches by 1 ½ inches. Beat egg white until it is frothy. With a pastry brush, spread egg white over cookie logs. Spread coconut in a 11 x 7 pan. Roll logs in coconut until coated. Wrap logs tightly in plastic wrap. Chill until very firm. Preheat oven to 350º F. Line cookies sheets with parchment paper. Remove logs from the refrigerator. Using a sharp knife, cut logs into ¼ inch disks. Set rounds on prepared baking sheets. Bake cookies for 9-11 minutes. Remove from the oven when cookies are set and coconut just begins to brown lightly. Let cookies cool for about a minute before using a spatula to remove them from the sheet to a cooling rack. Drain and blot cherries thoroughly before mixing them into the dough for Pistachio Cherry Refrigerator Cookies. Otherwise, the cherry juice will mix with green dough and create a color that is not very appealing during the holidays. See more inspiration on our Refrigerator Cookies Pinterest board.